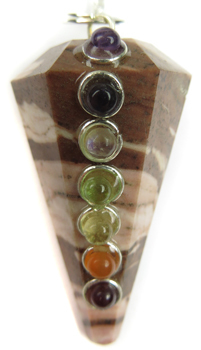 A faceted Petrified Wood pendulum with mounted gemstones to represent the 7 chakra colors. Comes with a velveteen pouch. Petrified Wood: Once an ancient, living, breathing tree. It was buried and fossilized, over a long period of time, and the organic parts of its structure were replaced by minerals. The markings on the crystal are the original tree’s growth rings and knots. Petrified Wood is an extremely grounding and protecting stone. Said to calm the nerves and fears and to encourage feelings of well-being, safety and security. Good stone for meditation and for helping you to distinguish between what is important and what is not, enabling you to stop worrying about the ‘small stuff’. Also said to be the stone for business success. It is believed to help restore physical energy, to strengthen the bones and to relieve hip and back pain.